The objective of this web site is to present the achievements of therapeutic endoscopy in the context of a specialized interventional pulmonology center. Following a brief reminder of the objectives and constraints inherent to our task, we focus on the necessary installations and equipment needed to create a specialized center such as ours. The specialized training required of the medical personnel, nursing staff, and technicians in rigid bronchoscopy, endoscopic resection, and stent placement are subsequently discussed. The goal of this web site is to offer a standardized approach to our methods, techniques and their clinical indications. It contains numerous documents illustrating the text by way of hypertext links. 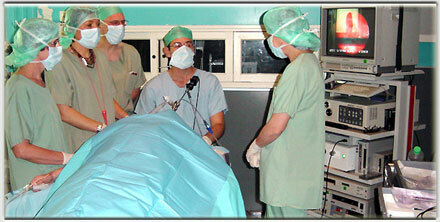 Much of the tutorial is reserved for practical clinical cases, and is illustrated by endoscopic films. Animation is sometimes employed along with occasional algorythms in order to complete our mission. This useful multimedia presentation also integrates text, fixed images, video and sound. The author of this site is Jean-Francois Dumon, MD, ex-chief of the endoscopic center and the laser center at the University Hospital Complex of southern Marseille, a world-renown expert on therapeutic bronchoscopy. This center has been transfered to the North University Hospital of Marseille and directed by Hervé Dutau MD, expert on therapeutic endoscopy. The French text has been translated into English by Dr Luis Seijo, currently at the Princesa University Hospital in Madrid, Spain, who completed his training in therapeutic endoscopy at the University of Pennsylvania. 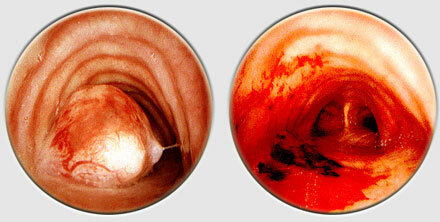 The goal of therapeutic endoscopy is to re-establish adequate ventilation to a patient whose airway has been compromised by either intrinsic or extrinsic obstruction. This treatment must be considered as an immediate response to a medical emergency. 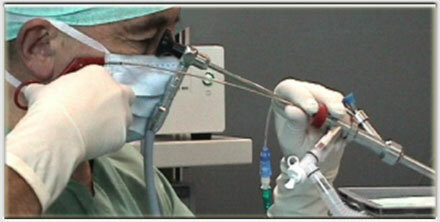 It must be thought of as the initial intervention, key in stabilizing the patient. Therapeutic endoscopic treatments are subject to certain rules, and demand the cooperation of a team of medical specialists (pulmonologists and anesthesiologists), nursing, and specialized technical personnel. The installations must be adapted to this purpose, and the equipment used should always be specifically designed for treatment of the airway.